I was recently gifted with a 4-in-1 countertop grill. It is a combo grill/griddle/panini press/waffle iron. Needless to say I was VERY excited to bring it home. Once I persuaded 2 coworkers to help me carry it out of the office, and stuff it into a cab - I was on my way to griddled glory. First night home with the grill, I looked for anything that I could possibly cook up on my new toy. 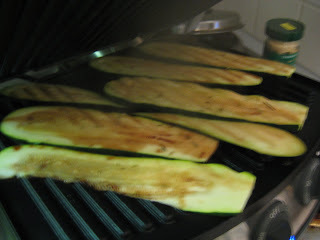 I was low on the produce, since it had been a week since my Boston Organics delivery - but I realized I did have a couple zucchini, and some red onions. I fished some mis-matched bread from different loaves from the freezer, and found some premade pesto and herb cream cheese (no regs sliced or brick cheese in the fridge). I proceeded to grill and panini. The first result was a mess, although delicious. I have refined my process immensely, so I give you my first panini creation. I then sliced my onion in very thick slices. 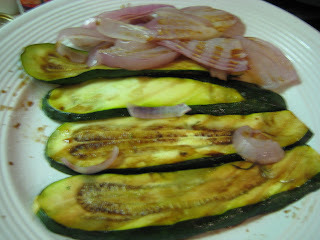 Once the zucchini became floppy and transparent, I removed them to a plate, then put down my onion slices. Now, as I mentioned, the first panini attempt was rather messy. I have found that there is a real talent to stuffing the sandwich so it is well filled and tasty, but also so it does not get soggy or fall apart. For this particular sandwich I employed a Trader Joe's Ciabatta roll. 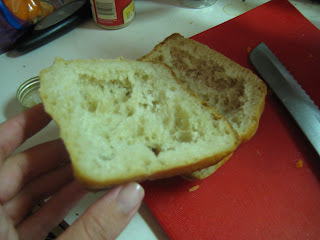 I sliced it in half, and removed the insides of the roll - to give more room for delicious sandwich toppings. The insides of several of these rolls are currently in a Ziploc baggie in the freezer - awaiting an opportunity for fresh breadcrumbs....mac and cheese or some sort of gratin...? 5 minutes later - a delicious dinner. 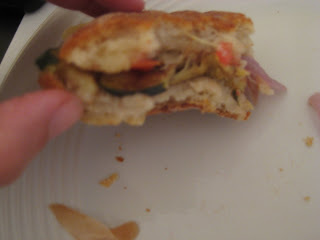 Apparently however, 5 minutes was not quick enough because I immediately dove into the sandwich before I could take this (somewhat blurry) picture. For someone like me - with an itty-bitty kitchen, this grill is a great way to branch out and do something a little different. It's also a great way to cook up my extra organic produce so I can have leftovers throughout the week - or freeze to limit waste. Expect some more panini's to come - and perhaps some waffles as well!!!!! Good idea to carve out the middle. I love my panini press too. Lots of easy and good meals.